MVCDC’s menus are also: free of fried foods; appropriate to the season; limited in fat, sugar and salt; and juice is limited to 4 ounces once or twice a week and is always 100% juice. Children 3-5 years old are served 1% milk and children under the age of 2 are served whole milk. Infants are fed as developmentally appropriate. Nutrition educational material is published on the back of every menu and is specific to the age group. Parents and caregivers are encouraged to submit healthy recipes to be published in the monthly newsletter and to potentially be put on the menu. MVCDC partners with other schools to provide healthy meals to some of its centers due to space constraints. Cost is always an important factor, therefore, MVCDC works hard to limit the obstacles for families. The MVCDC staff refers families to the appropriate assistance agencies (such as WIC, food pantries, Department of Job and Family Services), if needed, and they also educate the parents how to purchase and prepare healthy food on a budget. They encourage participation in home visits, parent meetings and trainings, and celebrations, while using successful parents as ambassadors. MVCDC completes height and weight checks at least two times per year and as a result, growth charts are discussed with families. Along with that, parents are given pamphlets on healthy eating, physical activity, childhood obesity prevention, and any other nutrition-related materials. Parents are also contacted by the agency’s dietitian and dietetic technicians for further nutrition education as needed or requested. The agency’s dietitian and dietetic technicians also participate in family engagement opportunities (i.e. parent meetings, parent trainings, special celebration events, etc.) as much as possible to promote a healthy lifestyle for the agency’s staff and families. 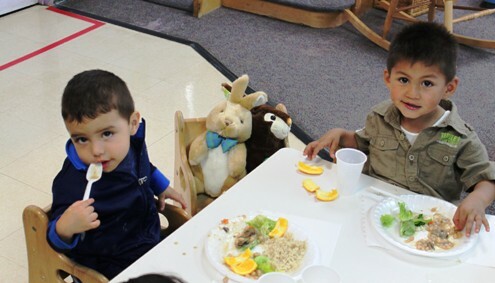 Deep Creek Country Day School in Chesapeake, Virginia is offering a healthier menu thanks to a Nemours-funded childhood obesity prevention program through Virginia Early Childhood Foundation and partners. The school recently received a grant for participating in “Taking Steps to Healthy Success”, Virginia’s Childhood Obesity Prevention Program. The nutritional value of meals depends on careful menu planning. Good planning can make a huge difference. This resource from CACFP looks at how to successfully plan healthy, appealing meals. It also covers family-style meal service, managing staff and equipment, and food ordering and purchasing.